After documenting America’s “romance” with illegal drugs in Hep-Cats, Narcs and Pipe Dreams (1996), Jonnes now addresses the era of urban electrification and its three giants of invention and industry. The author (History/Johns Hopkins) correctly senses and attacks the major flaw in public perception of such vast, life-changing processes—that it all somehow happens with the wave of a hand. On the contrary, Jonnes demonstrates errors and setbacks were all too common. For example, when J. Pierpont Morgan decided to have his New York City mansion wired for lights by the Edison Electric Company, this marvelous opportunity to attract investors was nearly ruined by an imperfect contact that set fire to Morgan’s expensively furnished library. 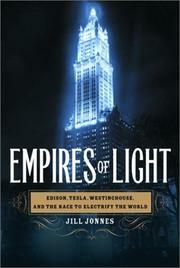 Even more revealing is Jonnes’s picture of Lower Manhattan in the 1880s when Edison began his major urban project. Poles of varying height above the streets already bore webs of dangling wires, the frayed remains of failed attempts to make “arc” lighting a commercial success. Electrification, Jonnes stresses, had to meld new technology with vast capital resources to gain a commercial footing. All three of the giants—dogged Thomas A. Edison, optimistic proto-magnate George Westinghouse, and brilliant Nikola Tesla, the Serbian immigrant Westinghouse backed and exploited—learned the same lesson: good p.r. is everything. As Edison became the champion of direct current, rival Westinghouse used Tesla’s alternating current technology to win a growing list of clients. Edison’s unethical attempts to label AC as a “deadly” alternative were instrumental in the first use of electrocution to execute a condemned man in 1890, but the tide had already turned. Westinghouse was later kicked out of his own company by its board, and the tragic Tesla, who literally wired Niagara Falls as a generator, died penniless. Thoughtful and well paced, with the exception of a digressionary review of scientific developments in electricity from the Greeks to Faraday that temporarily slows the narrative to a crawl. Great Sleep! Reduced Cancer! 2nd Edition"